I would like to build something upon the hill at San Simeon. I get tired of going up there and camping in tents. I'm getting a little too old for that. I'd like to get something that would be a little more comfortable. Something a little more comfortable than tents? I'd say he succeeded, and admirably so. Built in the 28 years between 1919 and 1947, Hearst Castle (or "La Cuesta Encantada - the Enchanted Hill as he liked to call it) is one of the foremost attractions of Central California. It is large - 90,000 square feet of buildings; 56 bedrooms; 61 bathrooms; 41 fireplaces; 127 acres of gardens; indoor and outdoor pools; private airstrip; and the world's largest private zoo. Of course, you can do a lot when you own 250,000 acres and have a nearly unlimited budget. In Hearst's day he invited dignitaries, world leaders and the elite of Hollywood to join him for visits to La Cuesta Encantada to enjoy a "Hearst Castle sunset". Even though it ranks 11th in the list of largest homes in the United States, it is probably the most-visited, with more than a million people taking one of the five available tours through this huge estate. The tours all begin at the Visitor Center which is located not far off Highway 1. There is a movie shown on a huge 5 storey screen which give history and background information. Then you take a bus on the 5 mile long road which winds its way up the hill, past grazing zebra and other exotic animals. Your tour of the Castle then begins being led by knowledgeable docents. The Hearst Corporation donated the Castle and a bit of land to the State of California in 1957 and is a state historic park. The corporation did retain most of the land which is known as the Piedra Blanca Rancho and still raises cattle there to this day. Reservations are recommended for the tours. 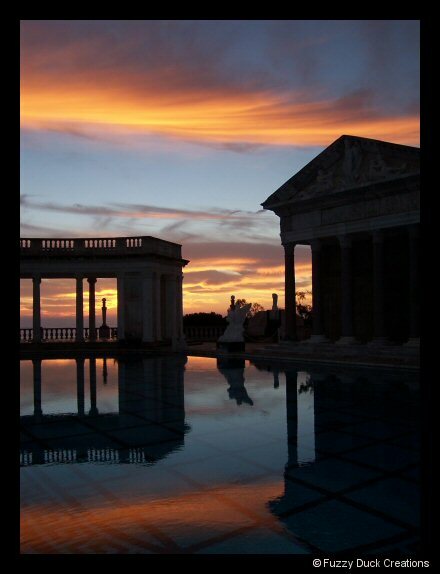 The Hearst Castle website has more information, virtual tours, and details about making reservations. When you visit, be sure to take your camera, lots of memory and extra batteries. There's bound to be another great shot that you can submit for a photo of the week. Do you have a great photo of the Central California area? Share it and it will be considered as the Photo of the Week right here! Click here to enter it for Photo of the Week!